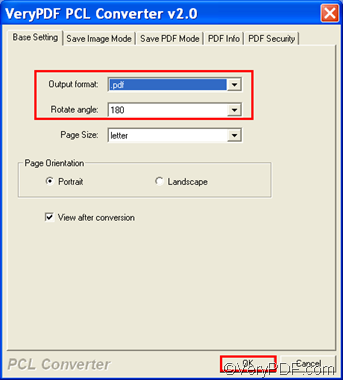 There are multiple document converters available online that can help you convert PXL to PDF and rotate the pages. As far as I know, at least three document converters can help you solve your problem: VeryPDF docPrint, VeryPDF Document Converter, and VeryPDF PCL converter. Each contains a command line version as well as a GUI version. This article introduces how to use the GUI version of VeryPDF PCL converter to convert PXL to PDF and rotate the pages. If you want to have a try, please click VeryPDF PCL Converter to download this document converter and then, take the following four steps to convert PXL to PDF and rotate the pages. Please click its icon on the desktop, and click Open in the list that appears. Then, the interface of VeryPDF PCL Converter as follows will appear. To input files, please click the Add File(s) button under the list box of the interface. A dialog box will pop out. You can select the PXL files that you want to convert in the dialog box and then click Open to input the files. The file names and related information of the selected PXL files will be displayed in the list box. To set the output format and rotate angle degree, you should click the Setting button on the interface to open a dialog box as below. Please click on the Output format combo box and specify .pdf as the output format. Then, specify 270, 180, or 90 in the Rotate angle combo box as the rotate angle degree. After setting the options, please click OK. Please click Start on the interface. The Save As dialog box will pop out. Please select a folder there and then click Save. The computer prompts to convert PXL to PDF and rotate the pages. How to convert PRN to BMP and rotate the page? How to convert PRN to TIF and set color depth? This entry was posted in VeryPDF Blog and tagged pxl to pdf, rotate the page. Bookmark the permalink.